Back in 2016, we launched ArtStation Community Challenges in order to enable artists to improve their skills and compete in the spirit of community-based learning. Since then, we’ve made improvements along the way by changing to a 2 phase structure, adding hosts for feedback, creating new categories and coming up with fun, exciting themes so that each challenge is better than the next. 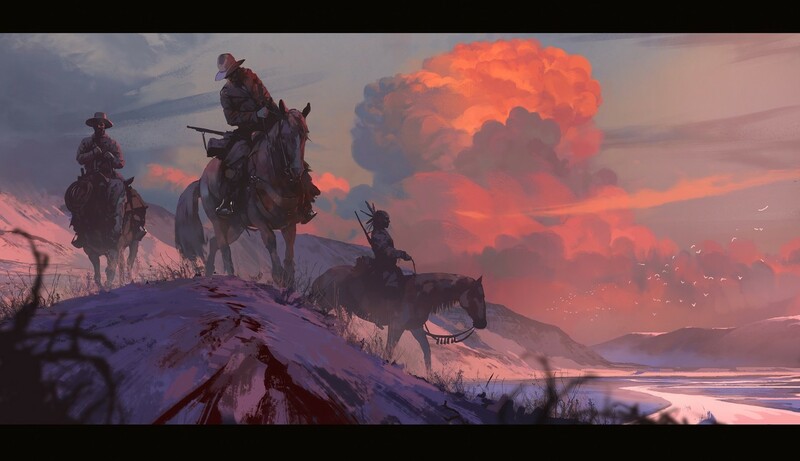 The latest Wild West Challenge was the largest ArtStation Challenge yet with over 4,000 participants. If you were following along or participated, you’ll have seen the volume of quality of entries was higher than ever, making the judging process especially difficult this time around. 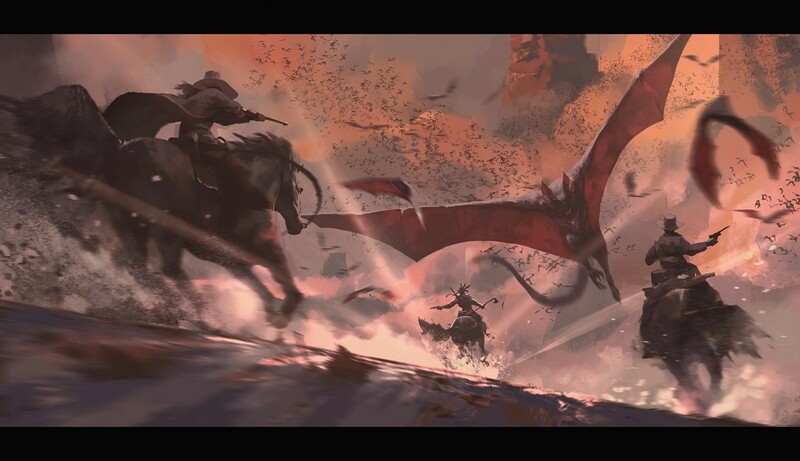 For the Keyframe Concept Art category, challengers were asked to imagine tales from the Old West and create 4 frames that show key narrative beats in their story. Browse all Keyframe Concept Art entries of the Wild West Challenge. In this interview, Wild West Keyframe Challenge winners Sina Hayati, Lap Pun Cheung, Samuel Smith share their experience, process, ideas and learning takeaways so can learn and bring it in the next Challenge! What was the main story you were trying to tell across your frames? Sina: The story is about an uncommon company of three people: an infamous gunslinger, a new sheriff in town and an apache known as the white wolf. They have gone through many adventures and now their destinies are somehow bound together. The story begins when they find Red valley town’s people all slaughtered by Camazotz (an ancient Mayan god). But the worst part is that White wolf’s niece is missing. So they decide to track down the beast and do all they can to rescue the girl. It is a short story about friendship, family and courage. Lap: Ever since I first heard of the theme, I basically knew I was going to do a homage to the Dollars trilogy but my girlfriend gave me the key point when we discussed the themes one night, which was just to make it all with dogs. It reminded me of the an old painting I did (shown in my challenge thread). So, I ended up doing the story of a Pug sheriff arriving in a desert town ruled by the ‘Big Dog Gangs’ and he ends up playing them against one another in an effort to rid the town of them altogether. Samuel: Because of the short timeframe and the limitation of only 4 panels, I wanted to tell a very simple story of a man seeking revenge, and the futility of that pursuit in such a ruthless environment. However, I feel like I still didn’t convey that story very clearly. I feel like it would have benefited from one more panel (showing the father burying his son) but didn’t have the time for it. Tell us a about your strategy and process for the challenge. Sina: My main concern in this challenge was narrating a compelling story through my pieces I did tons of thumbnails to find the proper directing that tells the story in the best way. After finding I wanted, I started to gather the references I needed among the movies and photographs, then I did my best to push the final look of my keyframes in the short remaining time. Lap: I pretty much have the same strategy each time I do a challenge based around keyframes. I focus on my own work, find a story to tell first and develop this as far as I can. Then I create sketches to tell as much of the story as I can before selecting the ones which I think best fit the brief and render them. As it’s a challenge with rules that are not my own, I try harder to follow the brief and specifications which sometimes means I’ll select images which might not have been necessarily my own first choices for images to paint. Samuel: The first step was to look for interesting photos and images of that time and/or place, and trying to feel what made them appealing to me. I did some random sketches of characters and one of them seemed like he could have an interesting story. I wanted him to feel like a peaceful man later drawn to violence by the harshness of his environment. I started with simple 3 value panels for the scenic shots to establish big graphic shapes as I was trying to evoke the vastness of the wild west, and with line drawings for the two close up shots (2 and 4) to concentrate more on the character’s expressions. What was the most difficult part of this challenge specific to the Wild West theme? Sina: I think the most difficult part for this challenge was staying away from the common clichés of this genre and creating an original story. Lap: The most difficult part of this challenge is that I’m pretty unfamiliar with the theme in general. I have never created any Western themed projects before and on top of that, I don’t do anthropomorphic animals often, which made this challenge quite new to me. Samuel: This theme has so many great sceneries and iconic shots attached to it… The hardest part was probably choosing my compositions to support the story, and refraining from just painting the things I wanted to paint. Which other entries stood out to you? Sina: Well that would be a very long list! This challenge was one of the most intense art competitions I have ever seen and was full of amazing ideas and crazy artworks. I would say all winners and honourable mentions did a great job. Lap: I really liked Samuel Smith‘s. It has a cool style to it. Samuel: The entry by Petter Faustino was definitely the best for me, and I’m very disappointed he didn’t win anything. Please check it out if you have a minute! What are your learning takeaways from this challenge? Sina: This challenge was truly a treasury of experiences. It was the first time I developed my own story in a sequential series of frames. I also committed myself to deliver high quality pieces in a short given time so I had to refine my pipeline in some cases which led me to incredible resolutions. Watching other artist’s entries was also like a master class for me and I learnt many things from them in terms of storytelling, composition, mood, color and style. Lap: Since I’ve been doing these challenges since they first started, I’ve been refining my method each time. I like the setup of the challenges as they push me to create something with a fairly realistic brief and a good amount of time for the deadline. I think this time round, I tried to focus more on creating the story beforehand. The more time you spend in the setup, the easier the execution goes. Samuel: I guess… don’t start 10 days before the deadline?